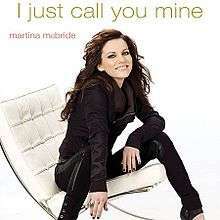 (2008) "I Just Call You Mine"
"I Just Call You Mine" is a song written by Jess Cates, Ty Lacy and Dennis Matkosky, and recorded by American country artist Martina McBride. It was released in May 2009 as the second single from her album, Shine. David Phelps, a Christian artist, previously recorded this song for his 2008 album The Voice. McBride performed the song on July 15, 2009 on NBC's Today when the couple got married during the show's 10th annual "Today Throws a Wedding" promotion. She also performed the song live on ABC's The Bachelorette on May 25, 2009. "I Just Call You Mine" is a mid-tempo love song, backed by percussion and electric guitar. The narrator speaks of how blessed she is to have snagged a lover who everyone thinks is amazing, but at the end of the day "I just call him mine." McBride commented on the song to CMT Insider when she was on set filming the song's music video. "I just heard it, and immediately I thought, 'What a beautiful love song.' I mean, doesn't everybody wish that somebody was going to sing this about them? And the song is a little bit different for me. It's a little bit vulnerable ... basically saying, 'I can't believe I have you, and everybody else thinks you're amazing, but you're all mine.' I love the fact that it's a little bit different. It's something that songs have said forever -- 'I love you' -- but it's said in a little bit different way, and I thought that was really cool." Tara Seetharam of Country Universe gave the song a B rating. "It’s pleasant and effective, and McBride’s soaring vocals are flawless, even tastefully soaring a little less than usual. But as her signature power ballads go, this one falls just a tad short of stirring emotion. [...]But that brings it full circle – few country artists are “limitless” as McBride has proven to be time and time in the past, and in turn, I expect more from her than a mediocre song like this one." A music video, which was filmed in downtown Nashville and directed by Theresa Wingert, premiered on CMT on June 15, 2009. In the video, McBride is shown standing in the dark with a single light behind her. As the video progresses, she is shown standing with many colored and white lights strung on wires in the background and in front of her, with tall buildings beyond them. Mixed with these are black-and-white scenes of different couples; a young couple are shown running on the beach, an elderly couple sitting on a bench together, and one woman is shown embracing her husband returning from war (among others). Some of the footage of the couples showcases different time periods, often appearing grainy and with the couples dressed to mirror fashion from the earlier 20th century, in addition to couples of today's time. The video debuted at number 20 on CMT's Top Twenty Countdown for the week of June 26, 2009. Sony Music Ireland revealed that the single's release was brought forward due to phenomenal demand. 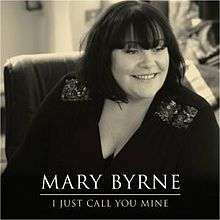 Mary Byrne unveiled the track from her album, ‘Mine & Yours’ on Irish radio, where the fan reaction was so positive that Sony Music Ireland were 'inundated' with requests to make the song available to the public before the album release. ↑ Country Universe: Martina McBride "I Just Call You Mine"
↑ "Martina McBride – Chart history" Billboard Hot Country Songs for Martina McBride. ↑ "Martina McBride – Chart history" Billboard Hot 100 for Martina McBride. ↑ "Chart Track: Week 23, 2011". Irish Singles Chart. "Where I Used to Have a Heart"
"Safe in the Arms of Love"
"Phones Are Ringin' All Over Town"
"Cry on the Shoulder of the Road"
"When God-Fearin' Women Get the Blues"
"(I Never Promised You a) Rose Garden"
"I'm Gonna Love You Through It"